Many years ago, 1996 to be exact, through my devotion to Sekhmet, I put together the Ancient Egyptian Virtual Temple on my ISP’s provided web space. Since that time, I have switched providers and the website has moved on to be housed on another site. Because of limited capabilities of that site now and outdated web coding, I am posting it on this blog page. Please bear in mind it is a work in progress, but for me it will always be a complete labor of love. This was and is a small taste of what I intend to create for my book, “Sekhmet the Beauty and the Terror”, which is due to be released November 1st. Her very Name means “She Who Is Powerful“. Sekhmet personifies the aggressive aspects of the female forms of Netjer and acted as the consort to Ptah. However, it is believed that Sekhmet’s worship pre-dates that of Ptah by at least several hundred years. Sekhmet is usually portrayed as a woman with the head of a lioness, but as the Daughter of Ra. Sekhmet is closely linked to the Uraeus (Buto or Wadjyt) in Her role as the fire-breathing, ‘Eye of Ra’. The pyramid texts themselves mention that the King or Pharaoh was conceived by Sekhmet, Herself. 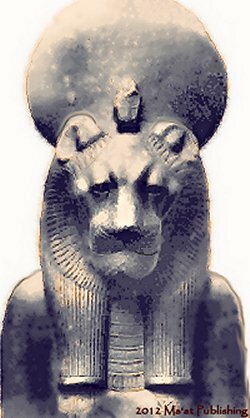 Sekhmet is one of the oldest known forms of Netjer in Egyptian history. She the ‘patron’ of the Physicians, Physician-Priests and Healers. Because She is one of the most powerful of all the Names of Netjer, (Her name literally translated means “Mighty One”, or “Powerful One”). Her Name is derived from the Egyptian word ‘Sekhem’, which means “power” or “might”. The word sekhem’ is literally inseperable from Sekhmet and Her worship. Because of these facts, She is often times misunderstood and portrayed only in a negative way This is probably because of legends of how Sekhmet, as the destructive Eye of Ra was sent forth to punish humanity for its mockery of Her Father, Ra. The myth of Sekhmet’s Creation explains how Sekhmet came into being from Het-Hert (Hathor). But in spite of the fact that She is sometimes ‘destructive’, Her qualities as Healer, Mother and Protector are often overlooked. In the realm of Ancient Egyptian Medicine, almost all healers and surgeons of Ancient Kemet would most certainly have fallen under Sekhmet’s jurisdiction. The chief cult centre of the Memphite Triad was located at Memphis. This triad of deities was composed of Ptah, Sekhmet and Nefertum. Sekhmet, however, in spite of her fearful reputation, had temples in several other areas as well. A sanctuary was built in Abusir where some images go back as far as the 5th Dynasty. Because of her synchretization with other deities such as Bast, Mut, And Sekhmet-Bast-Ra, there were other shrines and cult centres as well. Sekhmet is also mentioned quite profusely at the cult centre of Kom Ombo, which is sacred to the crocodile god, Sobek. At Kom el- Hisn in the western Delta, there is a temple that is dedicated to Sekhmet-Hathor. Sekhmet is invoked alongside Hathor at Hathor’s main temple located at Dier el Bahari, known in the earliest times as Iunu. Today, there is no temple still in existence that is dedicated solely to Sekhmet and open to the public with the exception of the one which is located in Cactus Springs, Nevada, located a short distance from Las Vegas. 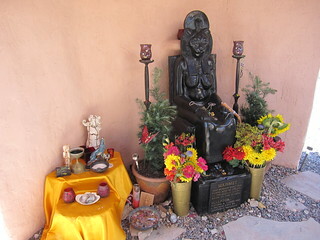 There are, however, countless shrines in private homes and temples throughout the world that are dedicated to Sekhmet. In a way, this is most appropriate since in antiquity, it was the norm for homes to have shrines dedicated to personal and patron gods. Sekhmet was worshiped throughout Egypt, particularly wherever a wadi opened out at the desert edges. This is the type of terrain that lions are often found. Many of them having come from the desert in order to drink and to prey upon cattle in the area. 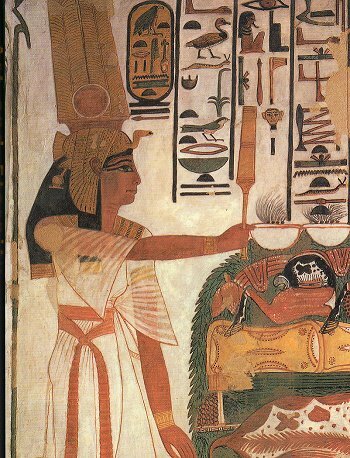 It is said that Her worship was possibly introduced into Egypt from the Sudan, because lions are more plentiful there. 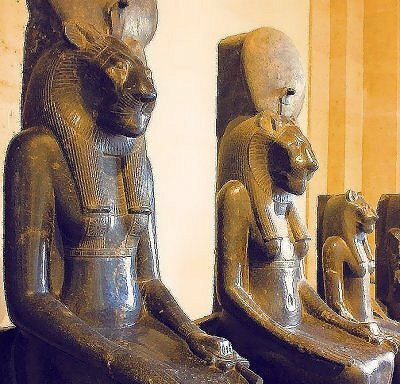 Sekhmet’s main cult center was located in Memphis, also known by its ancient name of Men-nefer, were central to Sekhmet’s worship until the shift in power that moved the capital to Waset or Thebes during the New Kingdom (1550- 1069 BC). It was at this time that the Theban Triad, made up of Amun, Mut (Amaunet), and Khonsu, caused Sekhmet’s attributes were absorbed into those of Mut. This meant that Sekhmet was increasingly represented as an aggressive manifestation of Mut and the Two Goddesses, along with HetHert (Hathor) and Bast were often synchretized. 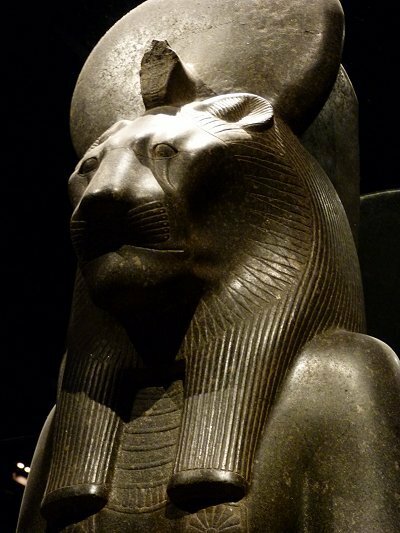 Mut-Sekhmet was the protectoress. 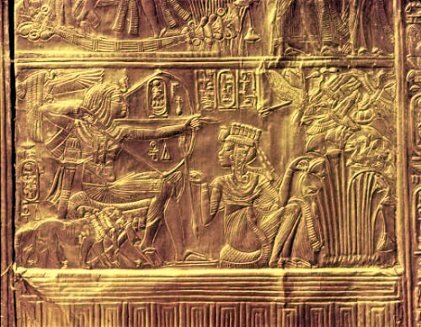 She was the Wife of the King of the Gods, Who also was incarnate through the person of the Pharaoh. Within the Mut Precincts were found large numbers of statues of the lioness-goddess which were erected by Amenhotep III (1390 – 1352 BC) both in the Temple of Mut at Karnak and also at his mortuary temple which was located in Western Thebes. It is estimated that there were perhaps more than 700 statues of the leonine goddess that were located at the Mut Precincts. Stele No. 1482 in the Cairo Museum, a false door from the tomb of Chief Physician to Pharaoh, NiankhSekhmet. Sekhmet’s action is always the right, or ‘appropriate action’. When She destroys it is an appropriate destruction or vengence. It is never chaotic or random. It is always what is needed at the time. Even though Sekhmet is not intimately linked with the aspect of destruction, as Set is, She removes threats and punishes those who do wrong against Ma’at. The formal rite of ‘appeasing Sekhmet’ was performed mainly by her priests in order to prevent or combat outbreaks of illness. The ‘Seven arrows of Sekhmet’ were especially to be feared and the rites for thwarting them were of primary importance. Truly, there is a seemingly endless array of both spells and charms that the ancients used as protection against Sekhmet’s wrath, as well as that of her messengers and demons. In antiquity, and today among the adherents of the Egyptian religion, Wep Ronpet is the time of year when gifts are exchanged, much in the same way that Christmas gifts might be exchanged. In ancient times, the Egyptians would sometimes exchange amulets of Sekhmet in order to pacify the goddess and keep her wrath away, but also one of the key deities invoked in the destruction of Apep, the essence or representation of the uncreated. Sekhmet, along with Set and others among the company of the Netjeru, worked together to overcome this foe. Over the many centuries of Egypt’s history, these rites were not considered optional but absolutely essential to the continuation of the stability of the Two Lands of Egypt. Once the aforementioned rites were performed by the priests and the King, the cycle of Ma’at within the Two Lands could continue. State rituals involving Sekhmet were particularly important at Wep Ronpet. To the ancients, the main purpose of these annual tituals was to insure that the new year was in no way contaminated by any potential calamity of the year that was just ending. It is through these rites that the beneficence of the gods would ensure the proper eralignment of the seen and the unseen worlds and therefore uphold Zep Tepi, which is translated as ‘the First Time’, or ‘The Beginning’ or ‘The Source’. The other is the continuance of Ma’at, which is the balance of all that is right within Creation, community and ensures the order of a good and balanced life. Within the Rite of the Turning Back the Enemies of Ra, tnets are also thrown over Apep(Apophis), or the Uncreated One, so that it, too, could be ultimately destroyed – or at least for the course of that year. Sekhmet and her other, more benevolent side, Hathor, serve an important function in conjunction with each other. The Two Lands and the king are indeed one, and what befalls one, will almost assuredly befall the other. “Son of Ptah. whom Sekhmet has born,” “Son of Amun, whom Mut has born,” and “the Image of Ra,” are all titles bestowed upon the king and are repeated upon the Golden Shrine of Tutankhamun and these were later incorporated into the coronation rites of the king each year at the rite of the new year from the reign of Tutankhamun and into the 19th Dynasty through the Greco-Roman period. The two sides of the goddess, one raging and the other beneficent, underscores the idea that Sekhmet and Hathor are inextricably linked. Modern, self-described ‘hard polytheists’ may resist the idea of this. However, the evidence is overwhelmingly established toward a sort of polyvalency by the ancients that is difficult to refute. The entire company of Eye of Ra Goddesses, Sekhmet in particular, becomes a symbol of the pharaoh’s desire for his own unvanquishable heroism in battle. It’s Sekhmet who breathes fire against the foes of the King. This is clearly shown in the inscriptions and stelae depicting Ramesses II. Sekhmet is seen on the horses of the pharaoh’s own chariot, her flames are shown scorching the bodies of the enemy soldiers who are trampled beneath him. All of the pharaoh’s enemies can be seen falling to Sekhmet’s righteous fury and her protections that surround the King. and her most effective protections of the King. Egyptologist Alison Roberts in her book, “Golden Shrine, Goddess Queen: Egypt’s Annointing Mysteries” succinctly puts forth the idea that the Eye of Ra, whether appearing as Sekhmet or Hathor, comes together in the person of the Queen or Great Royal Wife. The only one who divorced himself from this ideal of the Queen as the Eye of Ra was Amunhotep IV, who was later known as Akhenaten. During his 17-year reign, Akhenaten completely turned his back on all of the Eye Goddesses, feeling that they were unnecessary within the cult of the Aten. 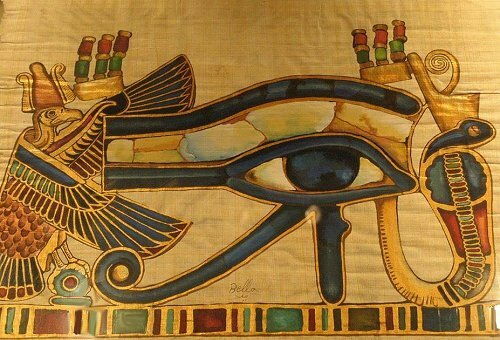 After Akhenaten’s death, and under the rule of Tutankhamun, this slight afainst all of the other gods including the other 70+ forms of Ra and his Eye, were quickly redressed. The boy king expended a great deal of effort in order to re-establish the previous forms of worship and the Eye goddesses that made it possible for the balance of life in the Two Lands to continue. Sekhmet’s worship has blossomed in ways that few of us could have even imagined as little as 25 -30 years ago. It was in the Spring of 1992 that Sekhmet grabbed me by my lapels and let me know in no uncertain terms that I was being claimed by Her. There are now several books that are either solely about, or mention Sekhmet in profusion. Once again, She has become an important figure in the collective mythology. Whether or not someone believes in Sekhmet as a literal entity or energy, or merely an anthropomorphic archetype, or perhaps something in between is unimportant. The truth is that today, Sekhmet is far better understood in terms of who she is historically and who She has become for the many who simply want to get to know her better. There is no doubt in my mind that Sekhmet is wonderful in terms of empowerment for her devotees. In terms of function, women and children especially will find no stauncher ally than Sekhmet. If you want to get on Sekhmet’s bad side quickly, be unjust, dishonest or harm the innocent. Standing up and protecting those who need protection has been a part of Sekhmet’s function from antiquity onward. All of that is essential to the conquering of isfet or willful wrong-doing and the upholding of Ma’at. Borghouts, J. F. Ancient Egyptian Magical Texts. Leiden: Brill, 1978. Print. Germond, Philippe. Sekhmet Et La Protection Du Monde. Genève: Editions De Belles-Lettres, 1981. Print. Masters, Robert E. L. The Goddess Sekhmet: Psychospiritual Exercises of the Fifth Way. St. Paul, Minn., U.S.A.: Llewellyn, 1990. Print. Meeks, Dimitri, and Christine Favard-Meeks. Daily Life of the Egyptian Gods. Ithaca: Cornell UP, 1996. Print. O’Connor, David. Amenhotep III: Perspectives on His Reign. N.p. : U of Michigan, 2001. Print. Paul, Christina L., The Ancient Egyptian Virtual Temple, “Sekhmet.” Sekhmet. PanHistoria, 01 May 1996. Web. Picknett, Lynn. “The Secret History of Lucifer”. London: Constable & Robinson, 2005. p. 54. Print. Richter, Barbara A. The Theology of Hathor of Dendera: Aural and Visual Scribal Techniques in the Per-Wer Sanctuary. Atlanta, GA: Lockwood, 2016. Print. 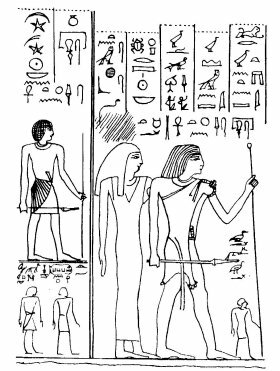 Ritner, Robert K. The Mechanics of Ancient Egyptian Magical Practice. Chicago: U of Chicago, 1993. Print. Roberts, Alison. Golden Shrine, Goddess Queen: Egypt’s Anointing Mysteries. Rottingdean, East Sussex: NorthGate, 2008. Print. Siuda, Tamara. “Sekhmet’s Creation.” Per-Bast.org. N.p., n.d. Web. 12 Aug. 2017. Wit, Constant De. Le Rôle Et Le Sens Du Lion Dans L’Égypte Ancienne. Leiden: E.J. Brill, 1951. Print.